The ruins of Minster Lovell Hall rise majestically from beside the banks of the River Windrush like something from a gothic horror novel. The land here has belonged to the Lovell family since the 12th century. The vast hall, now sadly in ruins, dates from 1435 and was built by the seventh Lord Lovell, on the site of an earlier building. However it is the fate of Francis, the ninth and last Baron Francis Lovell, that give rise to the many mysteries and legends surrounding Minster Lovell Hall. After fighting with Richard III at the battle of Bosworth, at which the king was killed, Francis fled and no-one is certain what became of him. However, it is recorded that in the early 18th century, during building and archaeological work at the Hall, an underground room or vault was discovered. In this room was found a skeleton, sitting upright at a table, surrounded by books, paper and pens. Perhaps the missing ninth Lord Lovell? 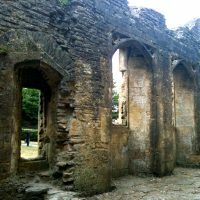 The setting of Minster Lovell Hall is today its most enduring appeal. Enjoy a picnic by the river and admire the fish that can be seen clearly in the crystal clear waters. Or take a walk through the meadows by the river or take the footpath through a small gate to view the surviving dovecote. The ruins of this magnificent hall link perfectly to the tip ‘Real wealth and freedom comes only from within’ because it doesn’t matter how wealthy you are in a material sense. Unless you are spiritually rich everything else will one day crumble into ruins.